Preheat the oven to 375 degrees. Brush olive oil onto bottom and halfway up sides of a 10 inch cast iron skillet. Reserve ¼ cup of the drained beans, set aside. Add the rest of the beans, sour cream, garlic, lime juice, cumin, and salt to a food processor. Puree until smooth. Taste and add a little salt if needed. Stir in chicken, corn, cilantro and 1 cup of cheese. 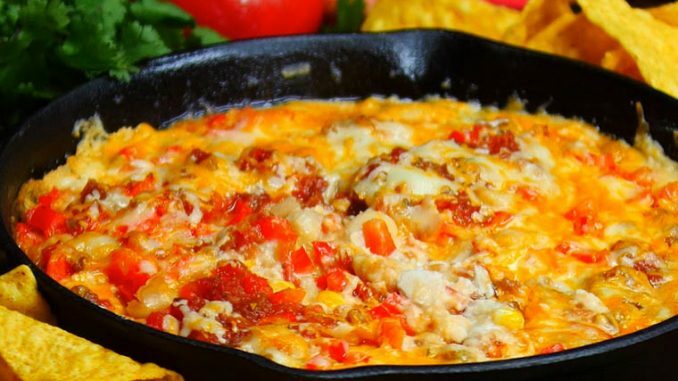 Spread onto bottom of skillet, then evenly sprinkle remaining ¼ cup white beans, red peppers and salsa on top of the mixture. Cover with remaining cheese. Bake for 16-20 minutes, until dip is bubbling and browned on top.